First Line: The oil road stretching into the darkness made me feel queasy, giving me a sense that I'd been there before. No matter how much the Parker family would love to have the world leave their home of Center Springs, Texas alone, it refuses. 1967 is winding down. Fourteen-year-old Top and his cousin Pepper are still finding it difficult to forget violent events of the past. Young Pepper has bought completely into all the peace and love of the Flower Children, and she decides to join them in California-- little knowing what's in store for her. Then a local farmer is killed in a hit-and-run on the same night as two businessmen are kidnapped and murdered. Constable Ned Parker thinks these two crimes may be connected, but he leaves the investigation in the hands of Sheriff Cody Parker. Instead Ned heads off in search of Pepper. Cody has hired a new deputy, Anna Sloan, who proves invaluable in their two investigations. And in the mean time, Pepper is out on Route 66, making her way to California in the midst of lies, deception, and outlaw motorcycle gangs. In the fifth excellent installment of Wortham's historical mystery series, it's the characters, sizzling action sequences, and tiny details that immerse you in the story from first page to last. With Ned out on the road looking for Pepper, other characters back home in Center Springs have to step up to the plate, and they do so in fine style. I was particularly impressed with Deputy Anna Sloan, a dedicated woman in a man's world who has a good eye for the telling detail. I look forward to seeing more of her. 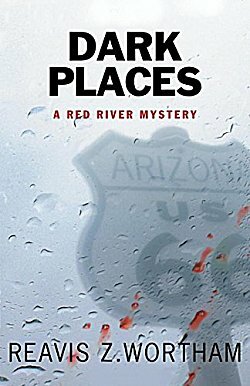 With a runaway child and two cases involving suspicious deaths, there's a lot going on in Dark Places, but it never once gets confusing. Tiny little details catch the reader's eye as the story progresses... a patch of grass, a cat's behavior, insignia on jackets... but the characters bind everything together. There's a very well-disguised cold-blooded killer to be found, as well as a helpful young man who isn't exactly what he appears to be. When your nerves get frazzled over the danger Pepper's put herself into, you get to see Top back in Center Springs, disgusted that he's the only one who has to stay at home while everyone else is taking trips. Top does get to play a part in solving a crime or two from something that he reads, and that just serves to reinforce something I read recently in another mystery: No reading is ever wasted. From rebellious teenagers to born killers to determined grandmothers to an old woman named Betty singing "O Holy Night," Reavis Wortham has taken us all on another period perfect excursion into the past that proves the strength of family and the need to do what's right, whatever the cost. This is one of my favorite series, and I'd no more miss an installment of it than I'd stop reading. I hope you join me in enjoying these books. It's best to start at the beginning-- The Rock Hole-- because Wortham's wonderful cast of characters grow and change. You won't want to miss a bit of that, I guarantee. The time context intrigues me about this one, Cathy. I like historical mysteries in general, and what an era this was. Glad you enjoyed this. It's an excellent series, Margot. Oh my, I went back and read your review of the first book and you mentioned WK Krueger, one of my absolute favorite authors! If this author is half as good as he is, I'm in! I'd never heard of this series, but as someone who lived in the '60s, I enjoy stories set in that time period. Thanks! I was roughly the same age as Top and Pepper back then, and Wortham certainly evokes many of my memories of that time. I think every time you write a review of a book in this series I mention the fact that I haven't started it yet. And it's in Texas. I better begin before there are 15 books to catch up on. I wish the library had more copies and I'd do a book club read of this author. I'll have to think on a way to do it.